As the only girl in Smurf Village, Smurfette definitely knows a thing or two about sticking out in a crowd. While many cartoon and comic book aficionados claim that she was created as nothing more than a marketing ploy to appeal to the little-girl demographic, she still has a network of fans who know how special she is. For the young and the young at heart, watching Smurfette dance her way through the day-to-day struggles in Smurf Village is a source of endless entertainment, and also an educational opportunity. These ten lessons are among those that kids have been learning from Smurfette for decades. It’s Possible to Overcome Questionable Origins – Smurfette is proof that even questionable beginnings can be overcome by determination and a strong work ethic. 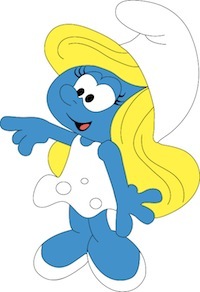 Despite being created by Gargamel to be an instrument of the Smurfs’ destruction, Smurfette was able to become an integral part of Smurf Village through hard work and a bit of help from Papa Smurf. Girls Can Take Care of Themselves – Though she has ninety-nine men at her disposal to do things for her, Smurfette is an independent girl who makes a point of doing things for herself. The importance of being self-reliant is depicted to kids through Smurfette. It’s Okay to Be Different – Though she’s the only one of her kind, Smurfette knows that it’s okay to be yourself. For kids who’ve grown up watching her, this lesson can also be applied to the things that make them different. Influence Should Be Used For Good – Though Smurfette typically tries to avoid using her power as the only female Smurf, on notable occasions she will relent if the action will result in something that benefits Smurf Village, such as offering a kiss to the winner of the Olympic Smurfs in order to boost participation. Adoptive Families Are Strong Families – Kids who are adopted can learn a very strong lesson about the nature of adoptive families from seeing Smurfette and the one that she belongs to. Though she was not born into Smurf Village, she has been fully adopted and accepted as a member of the family. We Make Our Own Choices – When Smurfette was created, she could have chosen to carry out Gargamel’s evil plan; after all, it’s what she was designed to do. However, her desire to be better than her circumstances and become a real Smurf was so strong that she was able to triumph over her dark nature. This is a great way of explaining the concept of nurture versus nature to kids. It Can Take Time to Become Our Best Selves – Though it’s important to always be yourself, kids can learn the difference between simply following every whim and working to become their best self by watching Smurfette’s metamorphosis from mean, ugly Smurfette to her sweet and prettier incarnation. Keeping Your Ego at Bay is Important – Though most of Smurf Village is in love with Smurfette, she never lets that knowledge go to her head or inflate her ego. She is a great example of being confident without being conceited. It’s Wrong to Manipulate Those Around You – Gargamel’s plan for Smurfette was to sow seeds of jealousy and discord among the peaceful Smurfs by manipulating them. Knowing that this behavior was wrong, she instead sought Papa Smurf’s help and refused to hurt those around her. True Friendship Always Wins Out in the End – Despite their romantic goals, the Smurfs of Smurf Village know that friendship trumps a crush; as a result, friendships are preserved and hearts remain unbroken. As the only female in the group, Smurfette provides plenty of lessons for little ladies who easily identify with her and would happily follow her example.